The GR-12 is a 2.4GHz full range receiver with built-in telemetry, the Graupner GR-12 6 Channel receiver is small sized and lightweight, lending itself very well for small park flyers, lightweight hand launch sailplanes, helicopters and multirotors. The ultra-low voltage requirements of the GR-12 allows it to operate on a single-cell LiPo making ideal for DLG gliders. 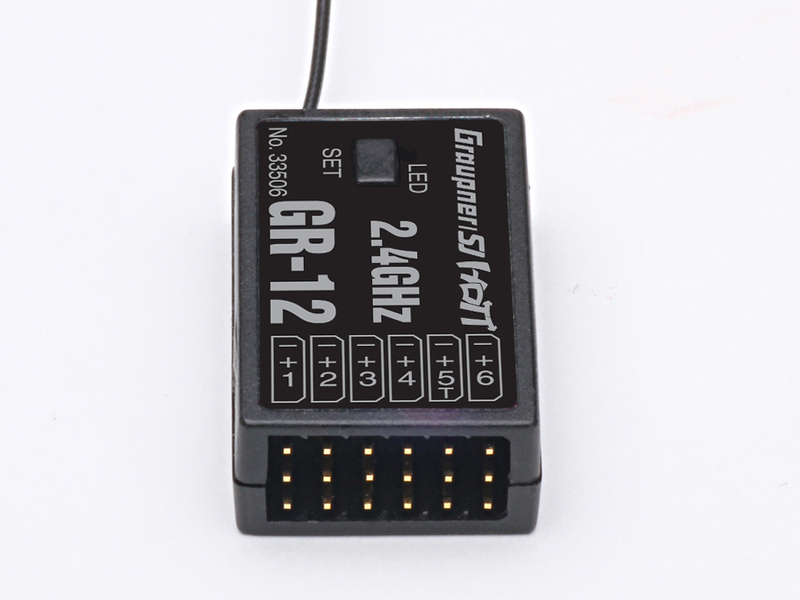 The GR-12 provides real-time bi-directional data transmission of critical system health data like temperatures, receiver voltage and signal strength using the Graupner HoTT protocol providing you with telemetry information you need for a safe and secure flight. The built-in program mixers allow increased flexibility in flight precision and function. A: Both receivers are identical on hardware and will have the same performance. The main difference is that the GR-12 firmware supports additional digital outputs (SUMD/SUMO/SUMI) and also 5 program mixers. Q: Does the GR-12 support Digital SUMD/SUMO/SUMI signal output? Q: looking at photos. don't see a plug for power? will we have to splice it into one of the 6 ch? A: You can power on any channel. If you are using a ESC/BEC than you can provide power on CH1. Q: Which is the best way to install the single antenna? A: Antenna should not be near to any metal, carbon or EMI generation objects. Having it pointing vertical improves its reception. Best way to know is making sure that the log file is actively recording your flight so that you can look at the L-Pack (lost packets value) after the flight. A: Yes, this is a HoTT receiver which is compatible with any other HoTT radio. Q: I fly large RC aircraft's and want to know what and if I need a satellite receiver. Do you have satellite receivers that plug into your existing Graupner receivers like the GR24 or GR16? A: When using our dual or quad antenna receivers there is no need for satellite receivers. They provide plenty of diversity and range using the HoTT protocol. Q: can i use a y harness on a channel for power and a servo? A: Yes, should be no problem. Q: What is the difference between GR-12 6 channel and GR-12L 6 channel receiver and what is the difference between mx 24 Pro and V2 (cheaper) radio, they bear the same software? A: Check the Q&A list as this has been answered before. The mz-24 V2 and mz-24 PRO have exactly the same software. Q: Hi I have a PA XR-61 inch 3d plane, is the single antena GR-12 suitable for this model or should I get a twin antena rx like the GR-16? A: Should not be a problem as the GR-12 and GR-12L receivers are considered full range receivers. Q: what is the difference between the GR-12L 6 & the GR-12L 6L? A: There is no difference beside that the GR-12 provides additional digital output. Q: What receiver and other products do I need to determine GPS ground speed altitude air speed & location ect? and be able to record a flight and play it back? A: You will need a GPS sensor P/N S8437 and install the firmware upgrade studio software that allows you to view your flight data log. Makes sure that you enable telemetry data logging.